Users licensed for the data service can access our Europe oil data. 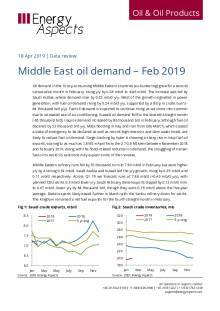 European oil demand rose y/y in January by 0.22 mb/d to 14.6 mb/d, the first y/y increase in five months. The recovery was aided by restocking demand in Germany and France, with declines in Germany easing, driven by recovering Rhine water levels and very low tertiary stocks. French demand recovered to y/y growth after protests had slashed demand over November and December, although the economic backdrop across the region remains weak and so we expect the recovery to be fleeting. Demand outside of EU-5 also recovered, rising y/y by 0.13 mb/d. Turkish demand declines eased materially to just 4 thousand b/d y/y following an average 0.16 mb/d y/y decline seen since September. Diesel demand rose by 0.46 mb/d, with EU-5 demand higher y/y by 0.24 mb/d, although government data show the bulk of the increase was in the heating oil category in both France and Germany. European gasoline demand fell by 69 thousand b/d, dragged lower by Germany. Interestingly, while gasoline car sales have been on the rise since the VW emissions scandal of 2015 and the share of new diesel vehicles have fallen sharply, the latest data suggest the trend has paused. For instance, Germany recorded a modest decline in passenger vehicle registrations, though those of new diesel vehicles increased by 1,948 vehicles y/y in January and 2,582 vehicles y/y in February, according to Germany’s Kraftfahrt-Bundesamt (KBA). Refinery runs fell by 78 thousand b/d m/m to 13.02 mb/d in January, with y/y declines of 0.16 mb/d. Planned CDU maintenance increased by 0.21 mb/d m/m to 0.51 mb/d (+72 thousand b/d y/y). The m/m increase in works was led by Spain (+0.16 mb/d) amid planned maintenance at Petronor’s CDUs at its Bilbao refinery (0.24 mb/d combined capacity) and Cepsa’s 0.12 mb/d capacity CDU at its Gibraltar facility. In Italy, maintenance grew m/m by 0.10 mb/d as planned works at the 0.13 mb/d capacity CDU at Sarroch (Saras) lasted five weeks until late February. While planned CDU outages are broadly flat y/y at 1 mb/d averaged across February and March, unplanned outages picked up, averaging 0.28 mb/d (+0.11 mb/d y/y). For instance, a crude pipeline leak knocked out the 0.1 mb/d Grandpuits refinery near Paris in late February, which remains shut during repair works. In Germany, BP is coping with an offline hydrocracker at its Gelsenkirchen complex and other unspecified difficulties at its 93 thousand b/d Lingen refinery. These outages come on top of the long-term shutdown of Bayernoil’s 0.12 mb/d Vohburg refinery north of Munich, which has been offline since September 2018 following a fire. Finally, the Grangemouth refinery (Ineos) is running near 50% capacity, with two CDUs offline. However, planned works in Q2 19 drop sharply, lower y/y by 0.83 mb/d at 0.63 mb/d.